As technology companies like Google scramble to address the lack of gender diversity in their ranks, a Seattle nonprofit is demonstrating a sustainable model for training women in software development. The 15 students in the first class of the year-long Ada Developers Academy (ADA) are wrapping up their internships now, and two-thirds of the local technology companies sponsoring the program have made permanent job offers. 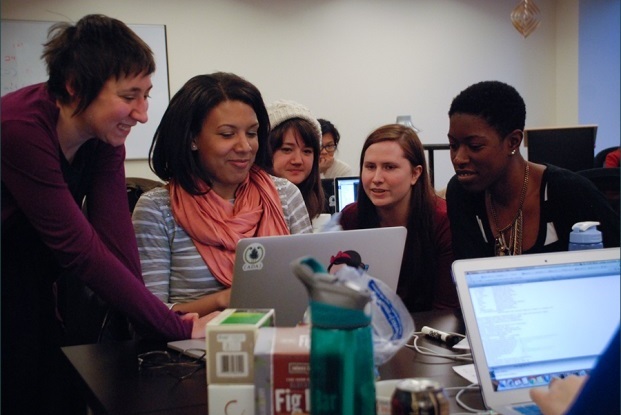 The tuition-free training program began its second class a month ago, expanding to accommodate 24 women looking to become software programmers. It’s also garnered new support from Amazon, Nordstrom, and Redfin, among others. Sue White, 24, has accepted a position with Zillow, where she was working as an intern. Other companies offering to hire ADA interns include Chef, Expedia, and Marchex. Those results come against the backdrop of a tech industry with thousands of unfilled positions in Washington state, and a dramatic under-representation of women and minorities. White, who grew up in the corn fields of rural Indiana, always had an interest in science and math but didn’t see the opportunities to pursue a career in computer science at University of Iowa. “I just needed to go to the West Coast to make this happen,” she says. She was researching Seattle on Reddit and saw a post about the ADA, launched last year with support from the advocacy group Technology Alliance, the Washington Department of Commerce, and about a dozen local companies. Applications were due that day. White, who had some exposure to programming through computer science and math courses, spent 12 hours pulling hers together ahead of the deadline. Another student, Ellen Wondra-Lindley, 24, had tinkered with the tech support website at a small company where she was bored working in customer service. She dabbled in HTML and friends had shown her a thing or two about jQuery. She took a couple of Code Academy courses, too. “I had made some progress, but I was not employable at all as a programmer,” Wondra-Lindley says. While ADA does not require students to have previous programming experience, the program is selective, accepting only 15 percent of applicants who completed the lengthy, demanding application for its first class. The acceptance rate fell to 12 percent for the current class. A third class is in the works. “It’s getting more competitive as we go along and more people know about us,” says co-founder and chief technology officer Elise Worthy. ADA and women-only programs like it are one way the tech industry can begin to address its gender imbalance, and big tech companies are paying attention. Google, which has embarked on a major effort to address the lack of diversity in its workforce, given ADA money to study best practices for bringing women onto technical teams, Technology Alliance executive director Susannah Malarkey says. ADA plans to produce a report to share publicly late this year. Like other programming schools that have bloomed in recent years, ADA is designed to teach specific, in-demand skills. The program focuses on full software stack development, the Ruby language, and agile development methods. As the curriculum evolves this year, instructors are incorporating more computer science fundamentals, such as data structures and algorithms, Worthy says. Lead instructor Bookis Smuin says the length of the course—six months of full-time classroom work, plus homework, followed by a six-month internship—is a major benefit compared to shorter programming bootcamps. The duration and small size of the program allows for a flexible curriculum that can be adjusted day by day or even hour by hour to match students’ progress. Early on, the students break into teams to build applications. Wondra-Lindley was proud of the first full-fledged e-commerce app her team built using Ruby on Rails, HTML, and CSS. “We had no idea what we were doing, but we made this really cohesive thing that we could then show off. I sent links to all my family members,” she says. Even as the students sometimes felt like they were struggling, the tech economy outside the classroom was—and is—clamoring for people with their skills. Smuin says some students were approached by recruiters within the first few months. “I think that gave them the sense that, ‘I’m valuable already,'” he says. But that notion was balanced by continuing fear—a feeling that the program was too good to be true, and the booming tech economy wasn’t going to apply to them. “Some people saw hurdles that they didn’t think they could pass,” he says. In addition to the prospect of permanent jobs, the six-month internships offer the students exposure to the real world of programming, and a bit of confidence. Reflecting on the progress she’s made in the last year, Wondra-Lindley says: “I never would have gotten this far, this fast without ADA.” She says it would have taken her years to gain similar competency while also working to support herself. Now she feels confident in her ability to contribute as a programmer. “That’s amazing,” she says. For White, the position at Zillow feels worlds away from the Indiana corn fields.